Other B4A v7.30 has been released! Discussion in 'Android Questions' started by Erel, Aug 21, 2017. Other B4A v7.01 has been released! I'm happy to release B4A v7.30. This is the first localizable version of B4A. A big thank you to all the great translators! Localizable IDE. Currently available in 23 languages. Resize / InitializeResize / LoadBitmapResize - Similar to LoadBitampSample but better. Allow setting the image to a specific size while optionally maintaining the aspect ratio and the bitmap scale. Scale property - Returns the bitmap scale. New ResumableSub type. Makes it simple to return values from resumable subs and to wait for resumable subs to complete. EditText - SelectionLength and SetSelection methods. SingleLine property added to Label, Button and other views that inherit from Label. View.SetVisibleAnimated affects the alpha level and the Visible property. Warnings for illegal methods in Process_Globals. Async dialogs are supported in classes. Compiled libraries can reference AAR libraries. Icon picker - aliases added to FontAwesome icons. Auto complete and auto format improvements. PhoneCalls (Phone library) - READ_CALL_LOG permission removed. It was added by mistake in a previous update. Canvas.AntiAlias property to enable or disable antialiasing. View.SetBackgroundImage returns a BitmapDrawable object. This allows changing the Gravity to CENTER instead of the default FILL value. 'load a background image while maintaining its aspect ratio. OkHttpUtils v2.61 - Job.GetBitmapResize and PATCH, HEAD and DELETE requests. Improvements to the layouts loader engine. It is more flexible with the variables types and a bit faster. This feature will allow to add cross platform views types. Bug fixes, including an important debugger bug, and other minor improvements. toby, Daniel Uribe, bgsoft and 38 others like this. aeric, metrick, Multiverse app and 1 other person like this. This is not the correct place to make suggestions. MarcoRome and Sapta like this. CSesma, Kwame Twum and Erel like this. Excellent, @Erel , very fast! This is amazing IDE for android development. Every version is going better! please how could i obtain that new version ? One more time thank's a lot Erel for your excellent job !!! Hi Erel, thanks for the update. Will this new version compatible with projects from old version? I have projects that builds with old version, mostly they are OK with new version but one of the project, when rebuild again with version 7 had a problem. One of its third party library didn't compatible with version 7, luckily i got library's source codes so it can be rebuild again with version 7. How about this one? Any particular things i should aware to avoid the same problem? Yes. It should be fully backwards compatible. If you have a 2 year subscription then you should get an email with downloadlink. If you have only 2 month subscription (then i guess it has ended already) then you should get an email-offer for a new subscription. Otherwise you can contact support@basic4ppc.com to ask for a quote. Great release. A feast for all B4A coders. Thank you Erel. I noticed the email I received to download the 7.3 update, was malformed in my email program. This is the first time this has happened with any of these B4A updates. The links also did not work. So I redirected the email to my browser and it too did not look correct and the links did not work. I did a jpeg screenshot of the email in my browser and this is what it looks like. (I had to select the text so it was readable otherwise it is black text on a dark brown background). I examined the HTML code and found the URL for the download and managed to download the update that way. Am I the only one who was affected by this? 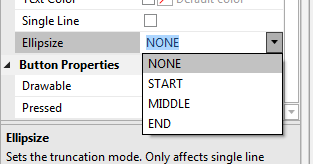 OK in MS Outlook too.